Aeroelastic model study attempts to take the guesswork out of the gust factor computation by measuring directly the magnitude of dynamic loads. These are measured using a variety of models ranging from very simple rigid models mounted on flexible supports to models exhibiting the multimode vibration characteristics of tall buildings. The more common types of models used in aeroelastic studies can be broadly classified into two categories: 1) stick models; and 2) multi degree-of-freedom models. In addition to the similarity of the exterior geometry, the aeroelastic studies require similarity of the inertia, stiffness, and damping characteristics of the building. 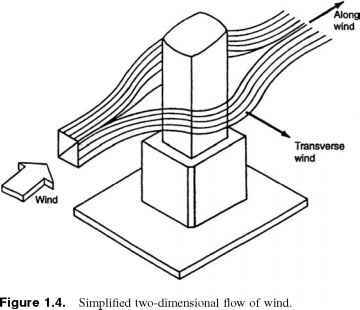 Although a building in reality responds dynamically to wind loads in a multimode configuration. 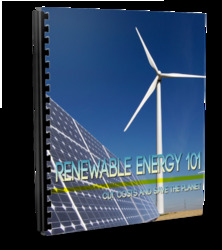 Enough evidence exists to show that the dynamic response occurs primarily in the lower modes of vibration. As a result, it is possible to study the dynamic behavior of buildings by using simple dynamic models. Aeroelastic study basically examines the wind-induced sway response, in addition to providing information on the overall wind-induced mean and dynamic loads. These tests are important for slender, flexible, and dynamically sensitive structures where aeroelastic or body-motion-induced effects are of significance. 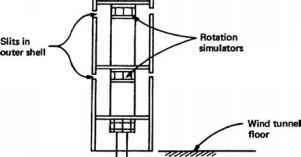 When a tall building sways and twists under wind action, the resulting acceleration generates inertial loads, causing fluctuating stresses. At any given instant, the amplitude of twisting and swaying motion is not just a function of the magnitude of wind load at the instant but also depends on the integrated effect of the wind over the several previous minutes. Therefore, for slender buildings it is important to consider the dynamic response when predicting design wind loads. 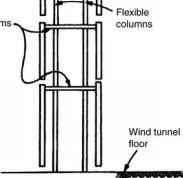 In addition to providing an accurate assessments of load for structural design, an aeroelastic model test provides one of the most reliable approaches to predicting building response to wind which can be used by the designer to ensure that the predicted motion will not cause discomfort to the building occupants. Typically, aeroelastic measurements are carried out at several wind speeds covering a range selected to provide information on both relatively common events, such as 10-year wind loads, which may influence the serviceability and occupant comfort, and relatively rare events, such as 100-year winds, which govern the strength design. The modeling of dynamic properties requires the simulation of inertial, stiffness, and damping characteristics. 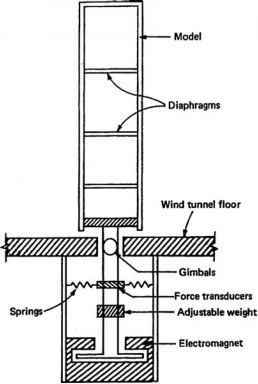 It is necessary, however, to simulate these properties for only those modes of vibration which are susceptible to wind excitation. 1. The building height-to-width ratio is greater than about 5; i.e., the building is slender. 2. Approximate calculations show that there is a likelihood of vortex shedding phenomenon. 3. The structure is light in density on the order of 8 to 10 lb/ft3 (1.25 to 1.57 kN/m3). 4. The structure has very little inherent damping, such as a building with welded steel construction. 5. The structural stiffness is concentrated in the interior of the building, making it torsionally flexible. A building with a braced central core is one such example. 6. The calculated period of oscillation of the building is long, in excess of 4 or 5 sec. 7. 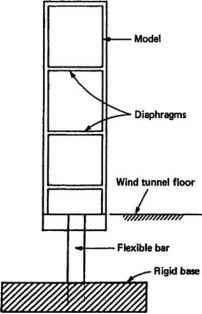 Existence of nearby buildings that could create unusual channeling of wind, resulting in torsional loads and strong buffeting action. 8. The building is sited such that predominant winds blow from a direction most sensitive to the building oscillations. 9. The building is a high-rise apartment, condominium, or hotel whose occupants are more likely than occupants of office buildings to experience discomfort from building oscillations. This is because residents are likely to remain longer in a given location than they would in a typical office setting. The main objective of conducting aeroelastic model study is to determine a more accurate design wind load and to predict building oscillations to get an idea of the degree of occupant sensitivity to building motions. Rigid-model study is based on the premise that the fundamental displacement mode of a tall building can be approximated by a straight line. In terms of aerodynamic modeling, it is not necessary to achieve the correct density distribution along the building height as long as the mass moment of inertia about a chosen pivot point is the same as that of the correct density distribution. It should be noted that the pivot point is chosen to obtain a mode shape that provides the best agreement with the calculated fundamental mode shapes of the prototype. For example, modal calculations for a tall building with a relatively stiff podium may show that the pivot point is located at the intersection of podium and the tower and not at the ground level. Therefore the pivot point for the model should be at a location corresponding to this intersection point rather than at the base of the building. Figure 1.22 shows a rigid aeroelastic model mounted on gimbals. The springs located near the gimbals are chosen to achieve the correct frequencies of vibration in the two fundamental sway modes. An electromagnet or oil dashpot provides the model with a damping corresponding to that of the full-scale building. Figure 1.22. Rigid aeroelastic model with gimbal. type, torsional modes are not simulated because the model effectively rotates as a rigid body about the vertical axis. Torsion is a consequence of an unsymmetrical distribution of building stiffness about its shear center, or it may occur because of eccentric disposition of lateral loads with respect to the center of stiffness of the building. Centrally supported concrete-core buildings often use open section shear walls that may have their shear centers located a considerable distance from the geometrical center of the core. Unless additional lateral resisting elements such as moment frames, braces, or shear walls are used on the building perimeter, torsional characteristics of the building may play an important role in its design. When such characteristics are present it is necessary to simulate not only the bending characteristics of the building but also its torsional behavior. This is achieved by introducing torsional springs in the aeroelastic model at appropriate locations along the height. To allow one section of the model to rotate relative to the next, the model shell is cut around the periphery. Figure 1.25 shows a schematic representation of a model with two cuts. The resulting model with three vertical segments behaves as a three-degrees-of-freedom system in torsion, and can therefore capture the dynamic behavior of the three lowest torsional modes. If a building geometry is uniform for the entire height, it is reasonable to assume that the sway modes of vibration vary linearly along the height. However, for buildings of complex shapes with stepbacks and similar major variations in stiffness, this assumption may not yield acceptable results because fundamental mode shapes may not be linear, and higher modes could contribute significantly to the dynamic behavior. Figure 1.26. Flexible aeroelastic model (schematic cross section). columns. A lightweight shell simulating the building shape encloses the assembly of the floor system, masses, and columns. The shell is cut out at these zones to allow for relative movements between the masses. Similarity among elastic properties of the prototype and the model is achieved to varying degrees depending upon the predominant characteristics of the building. For example, a building in which girder rotations and column axial deformations are negligible can be duplicated by using rigid diaphragms and flexible columns. Diaphragm flexibilities can, however, be simulated at considerable fabrication effort and cost. One of the basic reasons for undertaking aeroelastic study is to evaluate the effect of building motions on the comfort of its occupants. It is generally known that quantitative prediction of human discomfort is difficult if not impossible to define in absolute terms because perception of motion and associated discomfort are subjective by their very nature. However, in practice certain thresholds of comfort have been established by relating acceleration due to building motion at top floors to the frequency of windstorms. One such criterion is to limit accelerations of top floors to 20-milli-g (2% of acceleration due to gravity). The peak accelerations measured for a series of wind directions and speeds are combined with the meteorological data to predict frequency of occurrence of human discomfort, for various levels of accelerations. A commonly accepted criterion is that for human comfort, the maximum acceleration in upper floors should not exceed 2.0% of gravitational acceleration for a 10-year return period storm.